Both IT bellwethers face challenges, but which blue chip tech stock is best placed to generate returns for investors? Tech bellwethers Cisco Systems, Inc. (NASDAQ:CSCO) and International Business Machines Corporation (NYSE:IBM) have much in common. Both are superficially very cheap stocks, but as usual in such cases, significant questions exist over their strategic futures. What is the market afraid of, and are they worth buying on a risk/reward basis? Let's take a look. 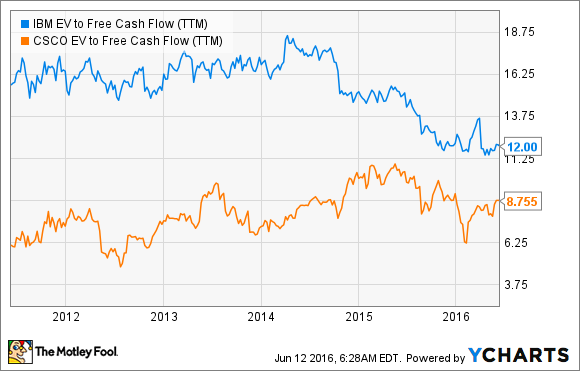 Both stocks look cheap, with dividend yields of around 3.6% and free cash flow generation that suggests they could pay much more. In addition, if you look at enterprise value (market cap plus net debt) to free cash flow, the stocks are worth buying even if they only grow earnings in line with inflation. To put these figures into context, IBM's EV/FCF multiple of 12 implies that the company is generating 8.3% of its EV in FCF. Moreover, the midpoint of IBM's FCF guidance for $11 billion to $12 billion in 2016 implies a rate of 6.5%. If an investment can merely grow FCF in line with inflation and interest rates remain low, then this is a good investment. Cisco Systems is even cheaper. The networking giant's EV/FCF multiple implies FCF generation of 11.4% of its EV. It appears the market is giving these stocks away. Is the market just plain wrong, or are Cisco and IBM facing structural challenges that will lead to declining earnings in the future? As service providers and enterprises move toward network virtualization using data centers in the cloud, Cisco could see declining demand for its core products, switches and routers. Increasing competition from China's Huawei and ZTE Corp. could curtail Cisco's growth in emerging markets and lead to pricing pressure through the commoditization of Cisco's products. A protracted period of slow economic growth would cause customers to delay refreshing with Cisco's products -- not good news for a company competing on quality, as competitors could gain time to catch up with their product offerings. Switching and routing combined produced more than 44% of total company revenue in 2015, and growth has been hard to generate in recent years. DATA IS FOR SWITCHING AND ROUTING COMBINED. DATA SOURCE: CISCO SYSTEMS, INC. PRESENTATIONS. In a sense, IBM needs to "do an IBM." I'm referring to the previous shift made from being predominantly a hardware business toward a higher-margin services business. Fast-forward to the present, and we see IBM shifting from its legacy services business toward what management calls its "strategic imperatives" -- security, analytics, cloud, mobile, and social. The idea is that revenue growth from the strategic imperatives will offset the declines from legacy services and lead to an inflection point whereby overall revenue starts growing again. Strategic-imperative revenue is growing strongly -- 17% on a constant-currency basis in the first quarter, and now representing 37% of total revenue. Moreover, analyst forecasts are for overall revenue growth to turn positive in 2018. DATA SOURCEs: INTERNATIONAL BUSINESS MACHINES CORPORATION and ANALYST ESTIMATES. ALL DATA IN BILLIONS OF U.S. DOLLARS. The key difference between the two investment propositions is that investors can feel more comfortable with IBM's strategic direction -- its strategic-imperative revenue is growing strongly, and data analytics is a strong point in the economy. However, the key question with IBM is at what level of revenue the inflection point will come? If analyst estimates are correct, and IBM hits its FCF target of $11 billion to $12 billion and then stabilizes and grows, then the stock is cheap. Cisco's stock is a lot cheaper on current metrics. Management has a net cash pile of $35 billion (nearly 24% of its market cap), but with only $6.3 billion in cash and equivalents in the U.S., and the business is currently highly cash-generative. In other words, management can buy its way to future growth, particularly in non-core areas such as security or data center solutions. Unfortunately, under former CEO John Chambers, Cisco's acquisition record was patchy at best -- Tandberg, Pure Digital Technologies, and Scientific Atlanta stand out as wasteful acquisitions -- and current CEO Chuck Robbins needs to rebuild confidence in the investment community. Cisco's future will be shaped by its acquisitions and how it deals with challenges to its core business. All told, both stocks are attractive. If forced to make a choice, I would prefer IBM because its strategic direction is clearer. That said, don't be surprised if the company falls behind in its plans at some point -- business transitions are notoriously difficult. However, if this occurs because legacy-services revenue is declining more than expected, then the ensuing stock selloff could lead to a good buying opportunity -- as long as the strategic-imperative revenue is still growing strongly. For Cisco, it's all about acquisitions and generating growth in its core switching and routing solutions. If the latter starts to deteriorate, then there will probably be a period of instability in the stock price before management's reactions are planned and articulated. On balance, then, IBM wins.